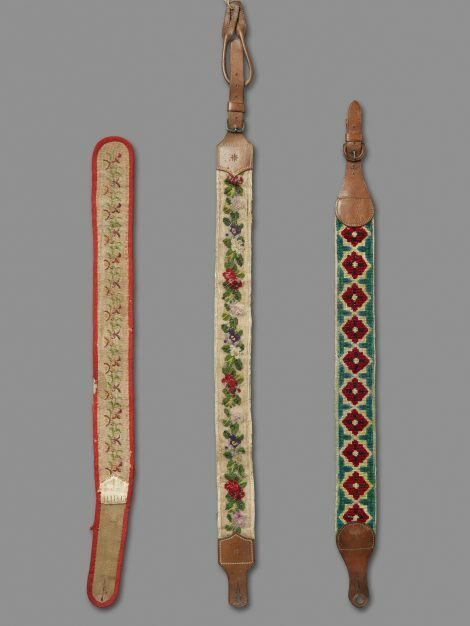 Braces were worn to keep trousers in place throughout the 19th Century and the first half of the 20th Century. Initially they comprised a pair of separate braces the ends of which were buttoned to the waist of the trousers at front and back. 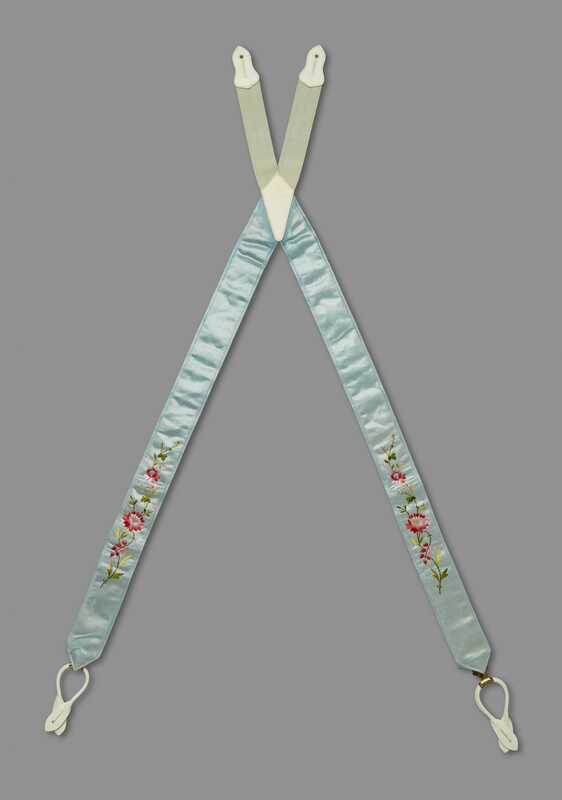 Three examples of this type can be seen in Related Items; they are all worked in needlepoint, probably at home as a present for a family member. These braces were superseded by a style with the two bands joined at the centre back as here. 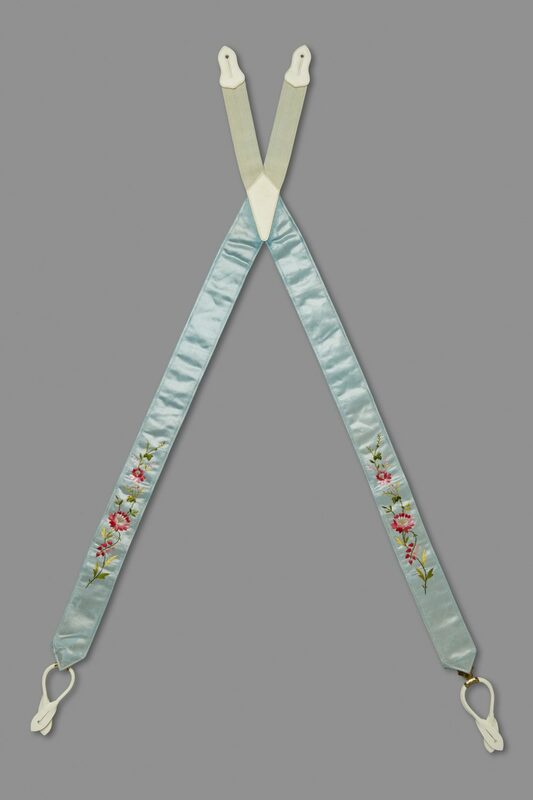 The embroidery on the blue satin is limited to the front, and the two beige straps at the back have a slight give to them, indicating that they may originally have incorporated elastic; elastic underwent much experimentation during the century and was welcomed by the manufacturers of braces for the flexibility it added to these essential masculine accessories. 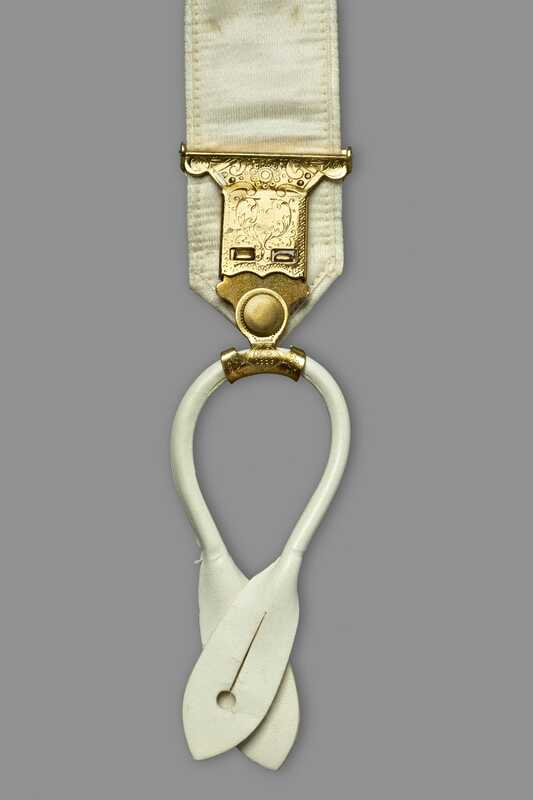 An inner flap of cream satin is linked to the pairs of loops on each side of the front by a gold coloured clasp engraved in an ornate curvilinear design and stamped ‘Wilson Brothers Pat ͩ Sept 25 1888’. The patent for this ‘buckle or clasp for suspenders’ (the American term) was granted to Paul Frantzen of Ohtoago, Illinois, assignor to the Wilson Brothers of the same place, on September 25th, 1888. 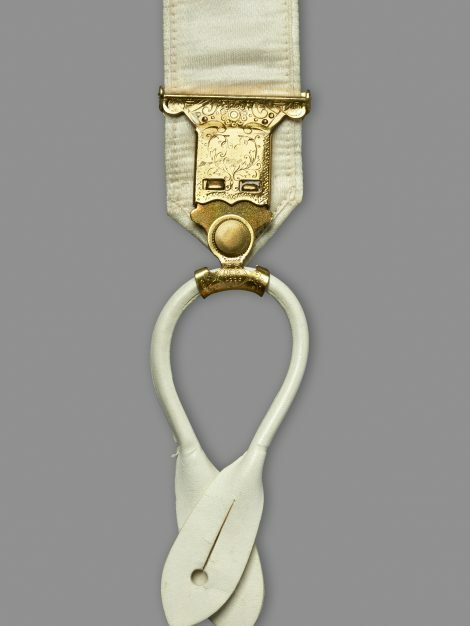 He stated ‘My present invention has for its object to provide an improved buckle or clasp that shall be cheap, durable, and strong in construction, and the members of which can be quickly connected or disconnected’.